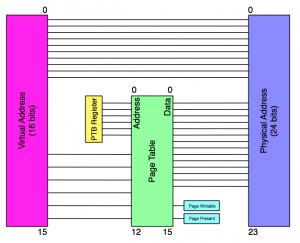 ECLair uses a 24-bit physical address space with 16-bit virtual addresses, and a paging system is used to translate between the two. When the system starts up the PE (Paging Enabled) flag is set to zero, and virtual addresses are used directly, only allowing access to the first 64kb of ROM, and no RAM or device space (this PE=0 memory map may or may not change later as the design continues coming together). When the PE flag is set to one, part of MAR is sent through the paging mechanism to be converted into a 24-bit address, allowing access to a large amount of memory, a small bit at a time.